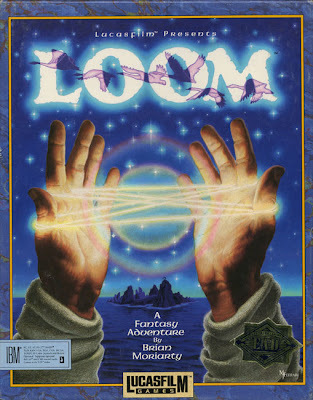 Loom is a LucasArts adventure game that gets rid of the typical SCUMM interface in favor of a magical staff. No items are collected and no verbs are selected. Everything is done with a combination of musical notes called drafts. Throughout the game, more complicated drafts are learned which let you do more things, and let you access new areas. Two sequels were planned but were never completed. Loom is now supported by ScummVM, a program designed to let 2D adventure games run on multiple platforms. With ScummVM, Loom now runs on modern versions of windows, as well as Linux, Mac OS X, and many consoles such as Dreamcast, Wii, PlayStation 2, and PlayStation Portable. For a complete list of platforms supported by ScummVM, see here.